Welcome to Unilorin admission guide. In case you have been asking; How does Unilorin give admission? Well, I am about to show you how Unilorin admission will be in 2019. What are the procedures and format Unilorin uses or will use to give admission in 2019/2020? 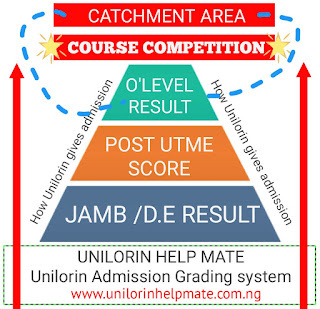 What is the Unilorin admission grading system? From today, you will know about these. This guide will help you learn Unilorin admission grading system. This guide applies to Unilorin admission system in 2019 ( in other words, you don't have to worry about outdated content since things change anyway). So without further ado, let's get started. Back then, when there was less competition. Unilorin admission criteria were probably less, it was an easy system. Fast forward to today, there are now so many criteria that Unilorin uses to give admission. How do you select the best out of 100, 000 student if for example there are only 11, 000 students available spaces? Let assume 60, 000 among these all crossed the cutoff mark. How will the school pick out 11, 000 for that session? Will they pick randomly? No! That's why the school introduced something that is called Unilorin admission grading system. The University of Ilorin (Unilorin) will use these set of factors in their admission grading system in 2019, knowing that will give you more insight in what to look out for, to know whether you're qualified for admission or not. But what the heck are they? Well, you're in for a great deal today because I'm going to reveal all the factors that may affect or favor you in Unilorin 2019/2020 Admission system, including the ones that you have been hearing but not true. Some are proven facts while some are controversial. Others are just Unilorin Admission nerd speculation. But we will review them all according to the infographic below which shows the hierarchy of Unilorin admission grading system. So hopefully we will figure out all the things you need to know about how unilorin will give admission in 2019. HOW DOES UNILORIN GIVE ADMISSION? These are the standing factors that Unilorin uses to give admission for every student and we shall critically examine each. I am not showing you this as show off, but i am showing you this to know your stands. In order not to waste your time should you fall below these factors. PS: This list is not comprehensive, but it's 80% accurate. So much so, Unilorin has some other factors not disclosed to the public. But whether good or bad, there is no other existing factor that Unilorin uses to give admission. If there is any other factor it should fall below these five factors mentioned above. So get it straight! The less you fall under these unilorin admission grading system, the less chance of admission you have. This is not a lame Unilorin admission grading post! This is exactly how it works. If you are not head inside, sorry to you. This is the first thing that the University of Ilorin looks out for in Admission ranking/grading system. It is something set out by the Federal government. Catchment area; simply put, are the states suggested by the Federal Government that all Federal Universities must comply with. That hopefully implies that students from a Schools catchment area have more odds of gaining Admission into that University. Therefore, any student from the states, in other words, the Catchment areas are viewed as an advantage, as they have more opportunities to be offered admission faster in that particular Institution where they are among the Catchment area. So 'how does Unilorin give admission?'. The first plain English simple answer is, they will consider you if you're an indigene or from the catchment area. Now that you know this, what are the States that belongs to Unilorin Catchment Areas? Thus, it's doesn't suggest that students who are not from the catchment Areas are left out of admission, as there are other grading systems that Unilorin gives admission with. What this simply means is that one of the factors that unilorin gives admission with is your indigenous origin. Those from the catchment Areas have higher chances of admission over those that don't. In light of these, many students change their state of Origin to either of the catchment areas, just to have a higher chance of admission. The whole Summary of this is, Someone searching for admission from Kwara State, who meets the other admission requirements will be considered first for admission than someone from Lagos State. The next question to ask yourself is, what is the course Competition more the competition the more the requirements. Remember what the school is trying to do is to select the most suitably qualified candidate for that particular course and session. Have it at the back of your mind that, if there are more candidates applying for your course, the farther you will be to admission. The lesser there are, the closer you will be. In summary: One of the most peculiar Unilorin admission grading systems is course competition. The next thing to look out for is your O'Level certificate being mindful for course you intend to use it for. If your result is poor, don't hope for a competitive course. A good course deserves a good O'Level certificate. So your admission chances also have a connection with your O'Level. Many students overlook this. Yes, you made Jamb You made Post Utme. But poor O'Level result, then they either give you another course or refuse your admission request. Unilorin is not a playground as they are strict in admission. So get back to your O'level result, how many A's and B's do you have? Is it all covered with C's? Is it one sitting? But i should warn you! Using two sitting (Waec and Neco combination) no longer counts. So sad! But that's the harsh truth! You can use two waec combination though. Not like, two sitting combination with Waec and Neco. Not that it is completely ruled out but it won't work for a competitive Course. This is one of the reasons student get a different course from what they applied for. Unilorin will not admit you without having good merit, this has to deal with the medium you are using for admission, whether Direct entry or Jamb. I.e to say, unilorin give admission base on the qualification you present I.e depending if you do well or not. Each medium you use has an impact on your admission. For example, someone with Jupeb results and Jamb results has different grounds to stand own. Someone who scores 240+ in Jamb cannot be compared with someone with 290+. 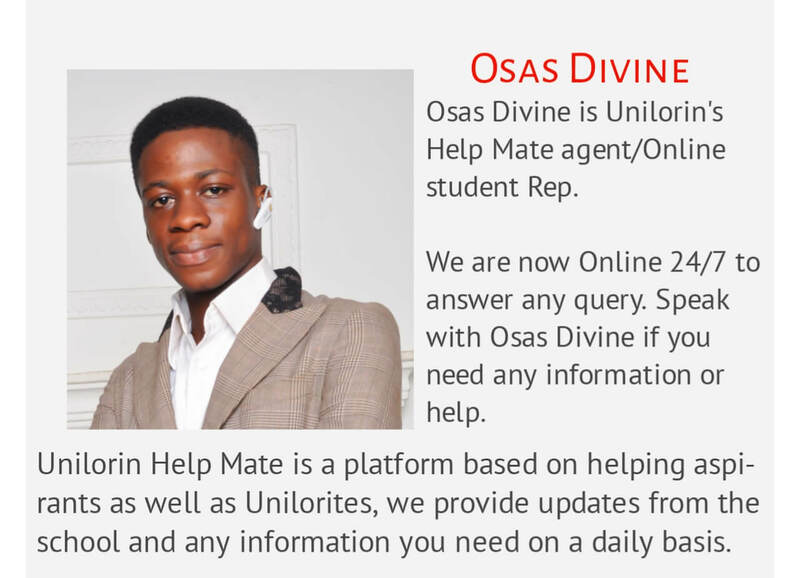 These mediums have ups and down and are not processed equally in the University of Ilorin. Jambites with a higher score are first considered. Those who score 270+ and above are ranked according to their course which we will discuss later. Unilorin Admission system for students with Ijmb certificate would be low, unlike before. Chances are, the number of students that Unilorin will give admission with ijmb qualification would be less in 2019. It appears like students from their catchment area or those who have connections in any way would have the chances more. Simply put, students from Unilorin catchment area, are the ones to be qualified for admission via Ijmb, partially. If not, you may be admitted but don't be very sure, and you may not even find it in the first or second list. Unilorin Jupeb program has taken more chances. Which means Jupeb students are more guaranteed for admission into the University of Ilorin since they can't ignore students from their own programme. I have given you two hidden factors that no one will mention to you, keep reading! Remedial students who made Jamb are also on a 90% high chances of admission. I hope you understand this! So whichever medium you are using, your chances increase if you score high with respect to the chosen course and the other factors. In Summary, your medium of qualifications greatly impacts your chances of admission. The surest means are Jamb, Jupeb, and Remedial. Other means too are approved but the above. Mentioned ones have higher chances. This is where the problem comes in because what you score in your post utme will be graded alongside other factors. So if you did not meet other factors, for example, you are not from their catchment area that means you must score high in Post Utme and have good merits in Jamb or Direct entry. Else, you will not be given admission. So, therefore, you have to obtain a good grade if you want to be admitted. Let me put more light. If you Scored 230 in Jamb and 50 in Post Utme. And you are not from their catchment area, someone from their catchment area with 220 in Jamb and 45 in Post utme would be admitted first. In the event that the cut off the mark for that score is 210 and post jamb is 40. Conclusion: How will Unilorin give Admission in 2019? Higher competition, less jamb or D.e score, Not from Catchment Area, Good O'Level or not, Did not score 70+ in Post utme. Then less chance of admission or No admission. Less, competition, Medium score in jamb/D.e, Not from Catchment Area, Good O'level, medium score in Post utme. Then you are 60/75% sure of admission. Higher competition, High jamb/D.e score, From Catchment Area, Good O'Level score, Medium or high post utme. Then you are 80/100% sure of Admission. Take note, you have a high chance of admission when the course has low competition if you present good merit from Jamb/D. E and get the required score in Post utme. Finally, Students that chose Unilorin as the first choice are admitted first than those that don't. More advisable, don't choose Unilorin as the second Choice. Or you would end up wasting another year. If you only met a few of the requirements above. Don't worry you could be given admission but I doubt if it is the course you applied for, if for instance, your course is competitive you must meet high in the factors mentioned above. I hope this article answers your questions "How does Unilorin give admission?"